At 14weeks post relaxer, the only way to blend both textures is doing some form of curls because flat ironing isn't even a question for me . Since I just had a full wash day I opted for a quick co-wash. Don' forget to check out Miss Dre Liebster Award questions here. Cleansed my scalp with Aussie Moist Conditioner. Wrapped my hair in a t-shirt for 45mins to absorb the excess water. hair and detangled again carefully. I had no issues detangling at all. then a smaller comb to make sure there were no knots or tangles before rolling the hair. 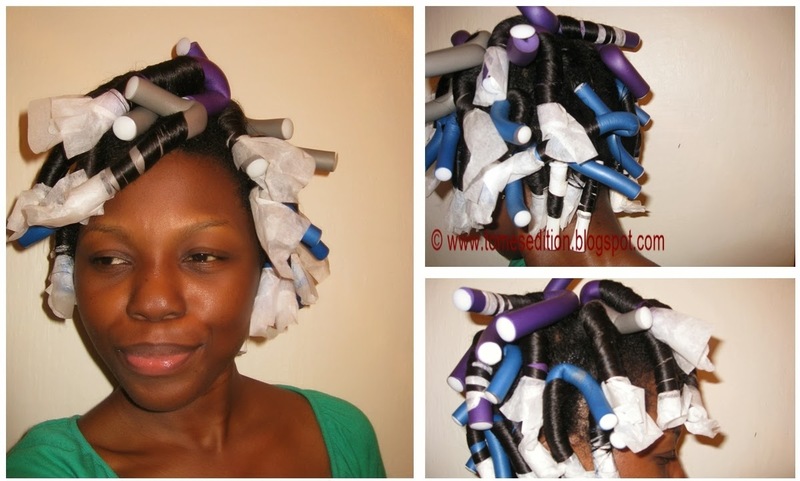 I had my moisturizing spray bottle on hand to keep my hair moist before rolling unto the flexi-rods. I used end wrap papers to secure the ends as the rolled the hair up in a spiral set. It took me about 1hr & 15mins to install 25 rods. Before getting under my hooded dryer I used my trusted Tresemme Heat Tamer spray and sat under the hooded dryer for 30mins. Since I was going to the midnight service I let the rest of my hair air dry. rest of the curls intact as you can see from the front curls. How did you wear your hair during the Christmas season? I bet your hair will look so full and pretty when you pull the curls apart with your fingers. Curls are so festive for the holidays. I usually wear an upsweep hairdo or topknot during the holidays, but I didn't wear my hair special for the holidays this year. I haven't done a topknot in forever, perhaps in 2014. God Bless for 2014 LV. Aww, this is such a pretty style! Will definitely try a flexirod set in the new year! Can't wait to see your rock Flexirods. Me Gusta!!! 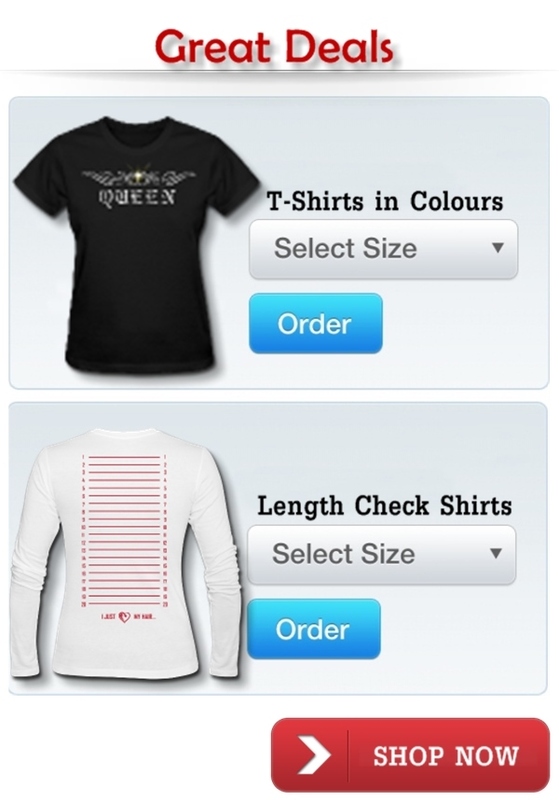 That is really nice!!!! I love love flexi rods they give you that humph and just look so good. Yours turned out so good and all those curls. 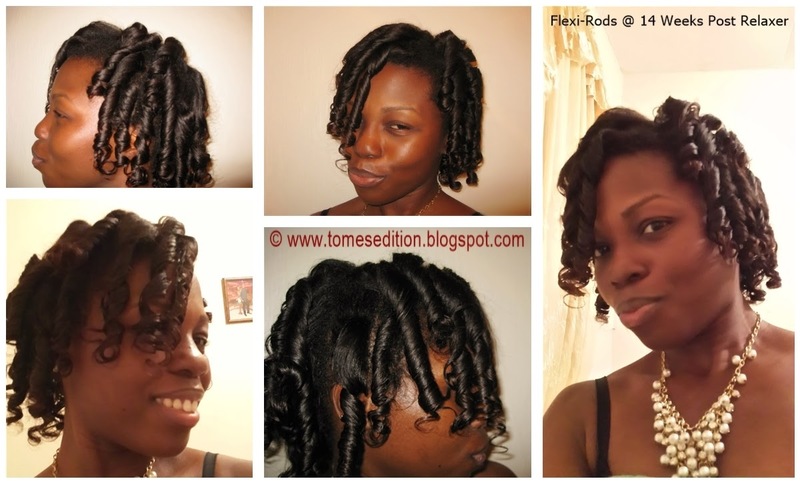 I want to bring flexi rods back in my routine, I usually only put about 5 o 6 in though. I have also discovered bantu knots and let me just say I have a new favorite. Do you do those sometimes? I straightened my hair for Christmas with a little twirl at the end and have been doing bantu knots to keep some curls in it for the rest of the year. I'mm not good at BKO but definitely going to give them a try for 2014. You have gorgeous hair, go ahead and put in some rods. Thanks Lesley. With your hair length they will be so pretty on you. Great results Tomi! This year I'm hoping to master setting my hair.